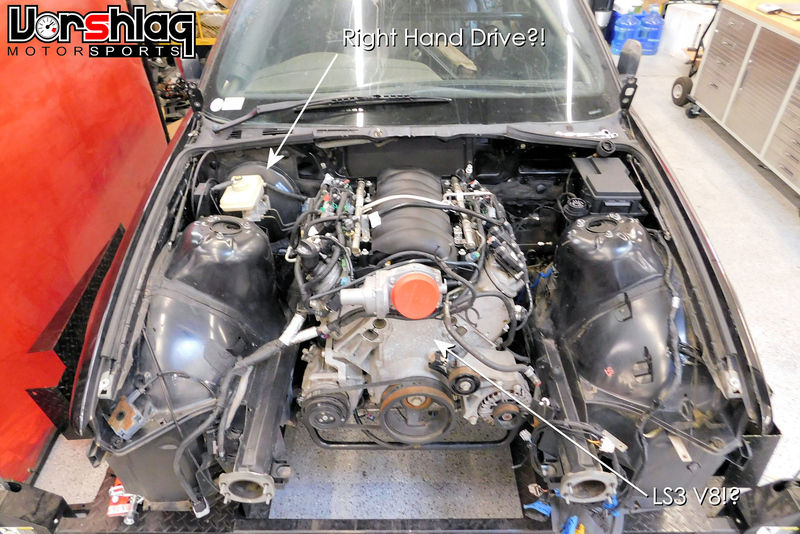 Project Begins - October 20, 2017: At long last we have found a Right Hand Drive BMW E36 Alpha candidate and we begun in-house development of the prototype pieces for an upcoming LS V8 swap kit this week. 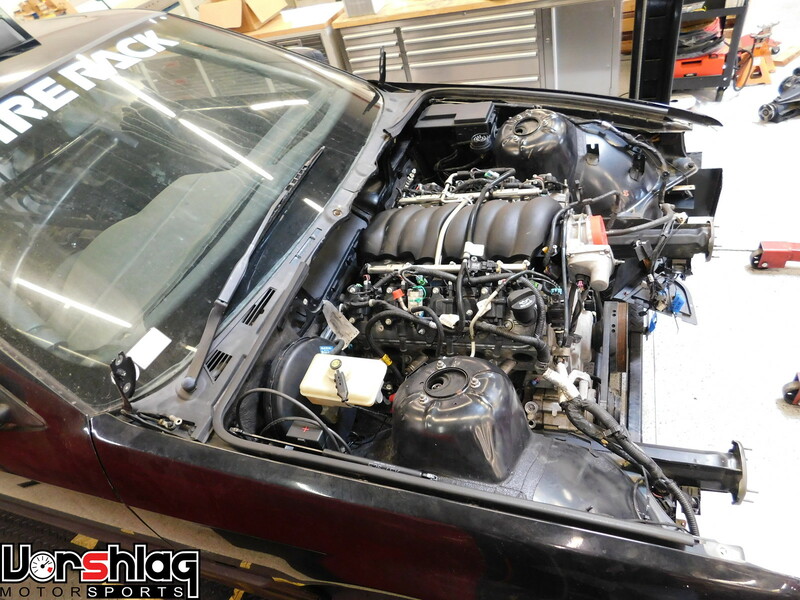 We have been working for the last 10 months to get this RHD E36 chassis here along with the right transmission, bellhousing, oil pan, engine, and other parts needed to begin construction of this prototype "Alpha" RHD E36 swap. This particular RHD chassis was one I almost bought 3 years ago, but missed out on. 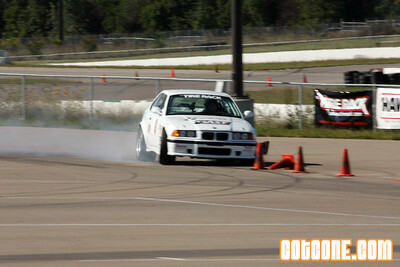 It was converted into an endurance road race car but the lackluster BMW straight six left the team wanting.... V8 power! We had the stock drivetrain out and the LS3 + TR6060 trans here some months ago but there was some confusion as to the proper transmission that would work. 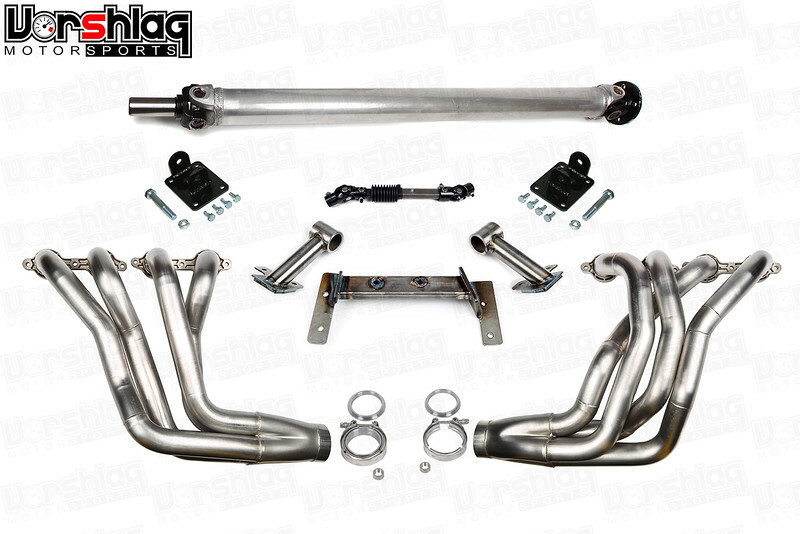 We want to build this kit around the factory 1998-2002 LS1 Camaro Borg Warner T56 -or- the modern, aftermarket, new Tremec T56 Magnum 6-speed manual. 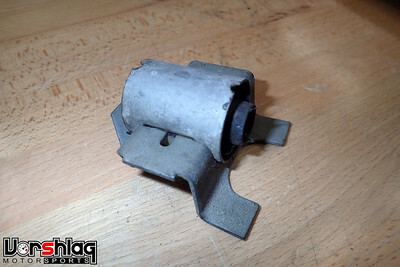 The remote shifted TR6060 from a 5th gen Camaro comes with a remote shifter (yuck) that is waaaay too far back for this chassis. 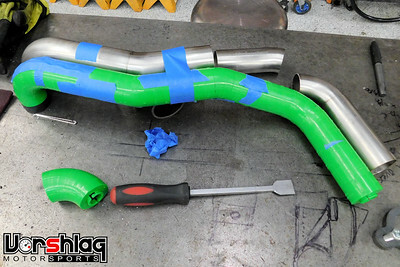 Recently the team we are building this Alpha swap for found a 4th gen Camaro T56, then we finally got a break in our schedule to begin, using our new fab guy Aaron as the lead tech on this project. Earlier this week Aaron got the engine bay power washed and the stock steering shaft removed. 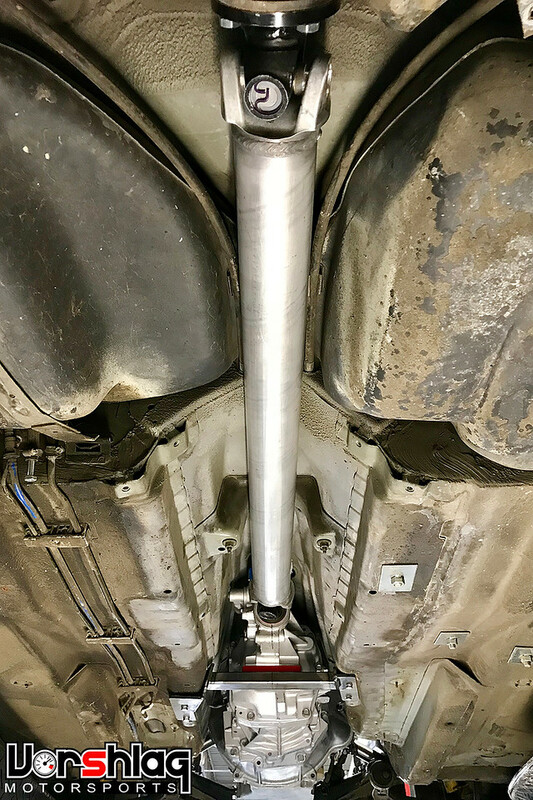 Then Jon built him a E36 Competition Steering Shaft we use on our traditional LHD E36 swaps (to gain room for the exhaust headers) and it fit perfectly. 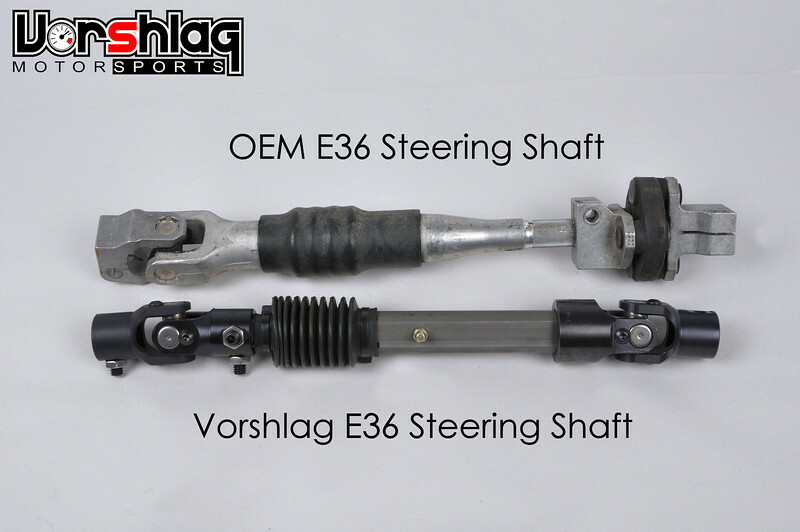 We knew it would as we had sold many of these to RHD E36 owners in the past (people use these in many race car builds to get rid of the sloppy rag joint equipped OEM shaft). We sourced one of our LS T56 aluminum bellhousings and bolted it to the LS3, re-using the original 5th gen Camaro clutch and pressure plate. 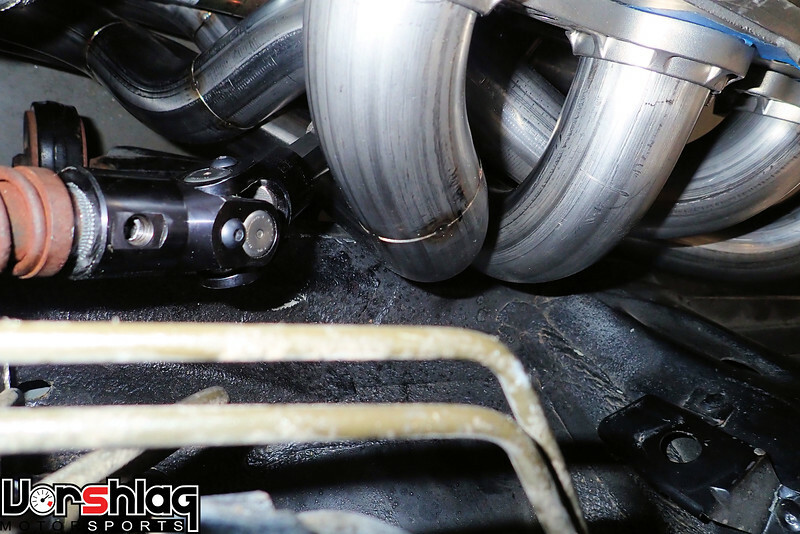 Stabbing the 1998-02 Camaro T56 into the LS3 proved difficult - it was hung up and sticking out by 1/4" - until Aaron measured and removed the LS3 pilot bearing. 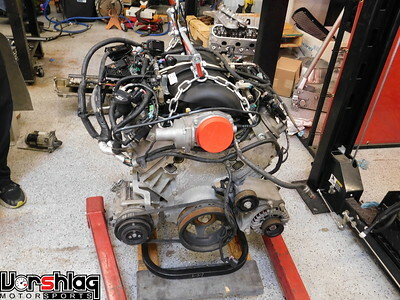 He swapped in an LS1 pilot bearing and the trans slid right home. The splines and diameters on the T56 input shaft worked fine with the LS3 clutch then. 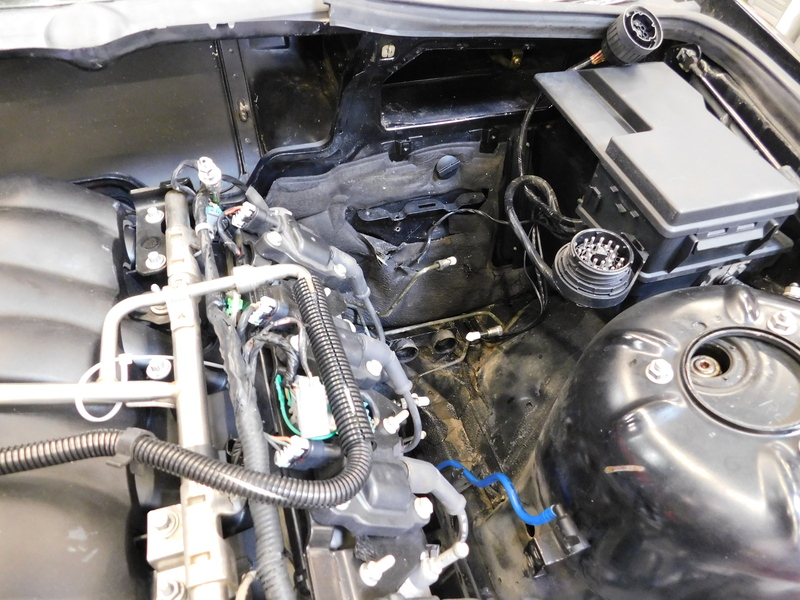 Next we needed to make some room in the engine bay. 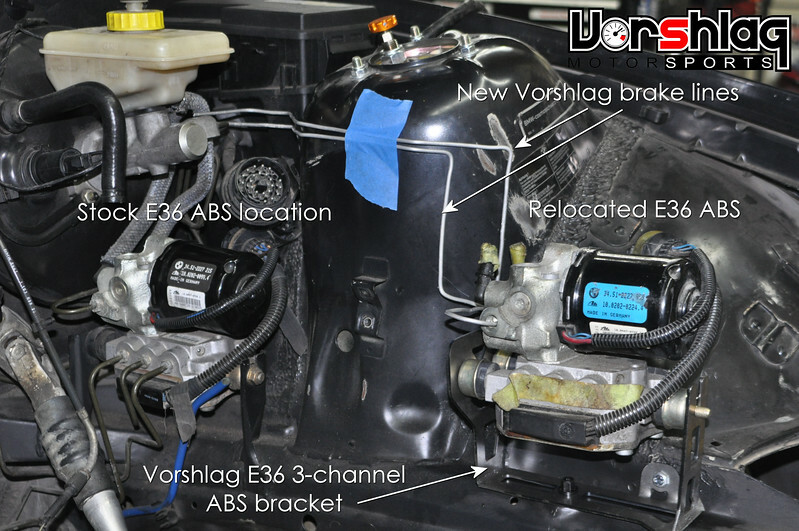 The charcoal canister needs to be relocated and the 3 channel ABS unit was also going to be in the way of the V8. Since the brake booster is on the other side of the engine bay we were able to simple relocate this only by about 8 inches vertically, making the need for an extended ABS wiring harness no longer necessary. We will show more of this when the relocation bracket is complete and the system plumbed. 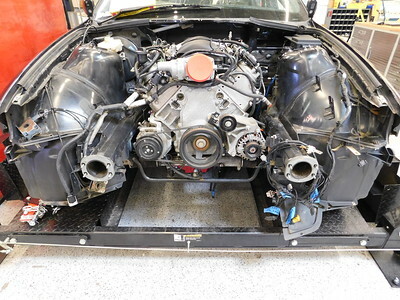 With some transmission tunnel mat material removed (it was falling off, as usual) and a few other things removed, the transmission and engine were finally ready to go into the engine bay. We played with front to back place and right side offset until we had the motor and transmission placed just right. This is a unique drivetrain placement that will clear the RHD steering shaft and brake booster + allow the use of both the OEM T56 we used here as well as the shorter T56 Magnum 6-speed without much modification of the factory shifter hole. 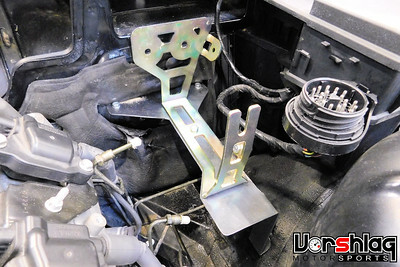 With this placement the Camaro LS3 accessories will even fit - which is a no-go in the LHD E36 swap. 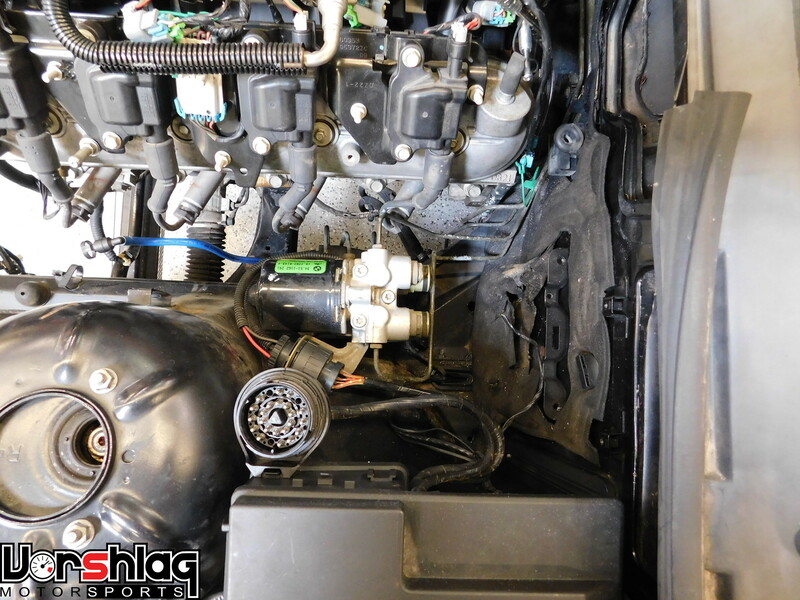 Lots of room on both sides of the engine bay with this location and the ABS pump pulled up out of the way. Aaron is already making an all new transmission crossmember for this RHD swap, shown above right. 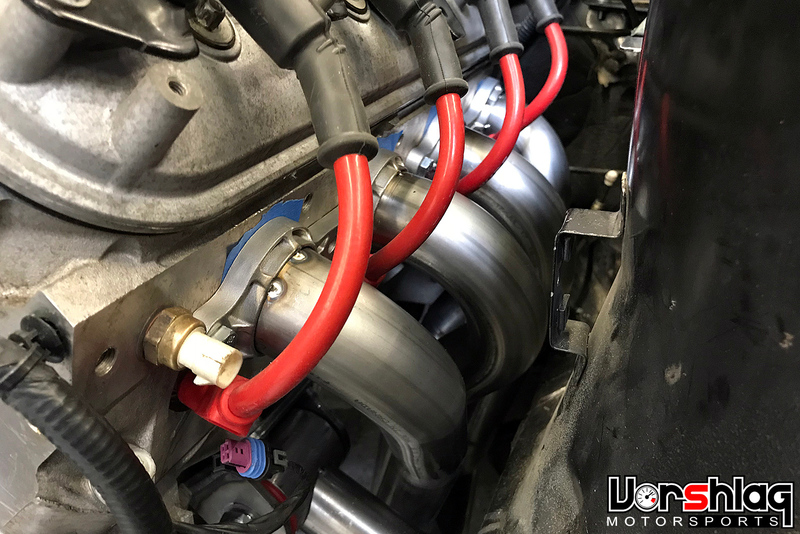 He will start on RHD motor mounts soon and prototype long tube RHD-specific 1-7/8" diameter headers will be built in the coming weeks. Last edited by Fair! ; 10-20-2017 at 09:28 AM. Project Update for December 4th, 2017: We've been working on this development project for the last month and a half, between billable work. We have to keep sneaking in work on this one, since I'm eating all of the R&D hours. 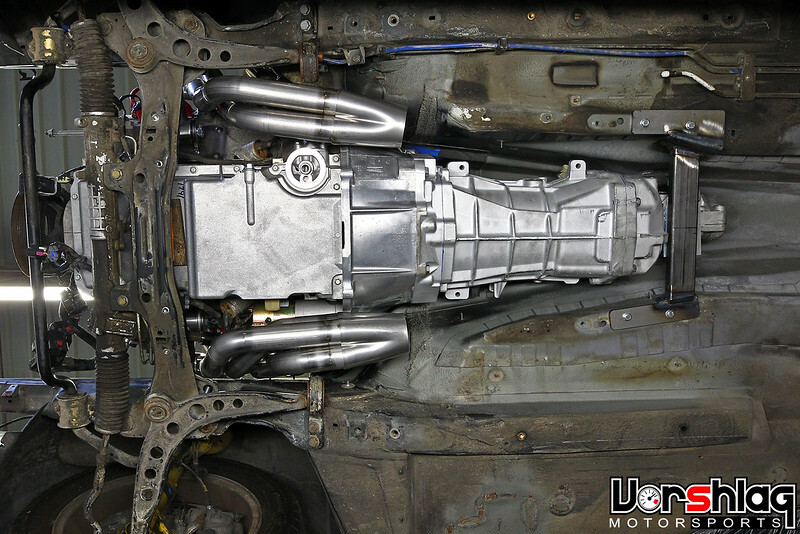 Last time we showed the LS3 + T56 drivetrain going into the RHD E36 chassis and since then we have finalized the placement, which included lateral offset from centerline, front-to-back placement, driveline angles and height. We've got some good projects updates to share below. 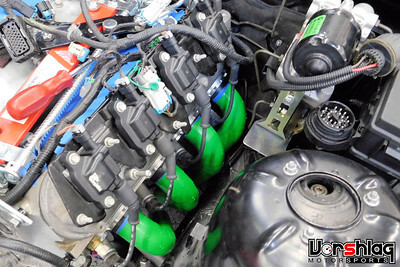 Not all LS engines are created equal. 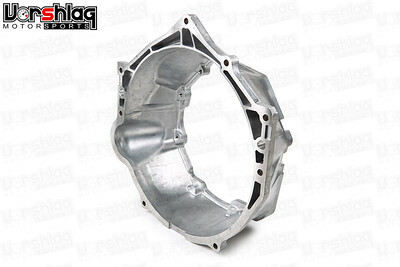 Sure, the motor mount and bellhousing locations are the same, and the external dimensions are also identical. But the bits that bolt to the "long block" can sometimes differ: starters, accessories, bellhousings, and oil pans. We have to change a few items out to gain the room needed to make this swap fit into any E36 chassis, which we will detail below. 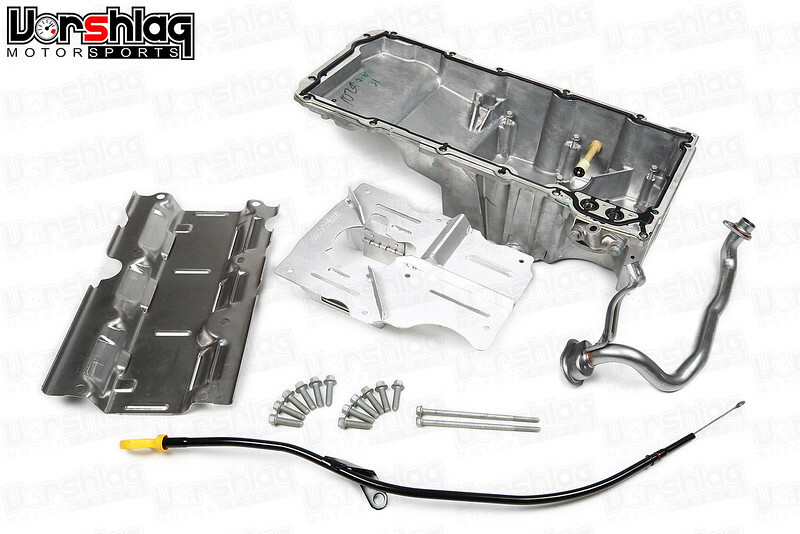 After looking at several OEM and aftermarket oil pans we once again went with the 1998-2002 Camaro LS1 cast aluminum pan. 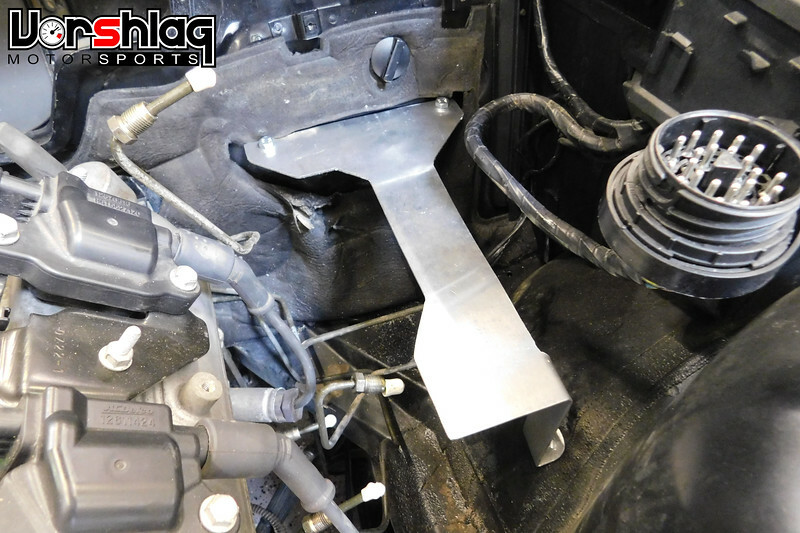 We used the same pan on the LHD swap, We can supply this new, with windage tray, dipstick/tube, and an Improved Racing baffle kit (any autocross, drift, or track car needs that kit). 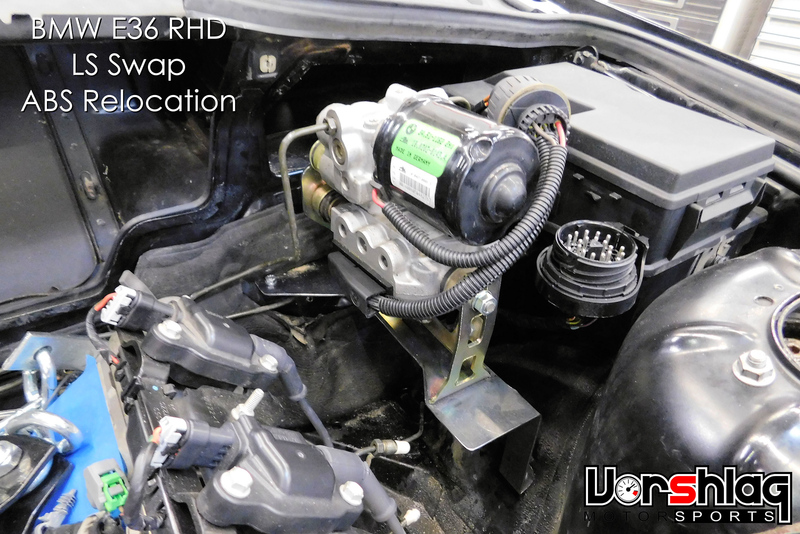 This upgrade applies to both RHD and LHD E36 swaps. With these parts on hand - including the correct starter bolts needed for this starter - we could start bolting together the important bits. At this point we weren't sure if the 2010-15 Camaro LS3 front drive accessories and brackets would fit, so those were removed before the drivetrain went into the car. Our existing Hydrailic Throw Out Bear/Slave + Remote bleeder kit worked, with a small change to the section that connects to the OEM slave cylinder. 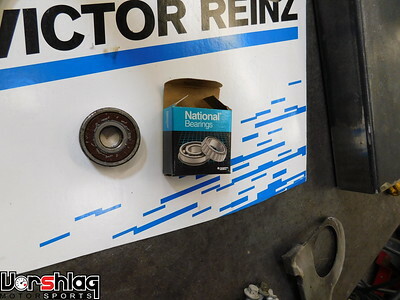 This was attached to the LS3 clutch kit, then the bellhousing we supplied was bolted on with the new starter, and it was time to stick the drivetrain into the engine bay. But first - we needed to test our smaller diameter steering shaft. 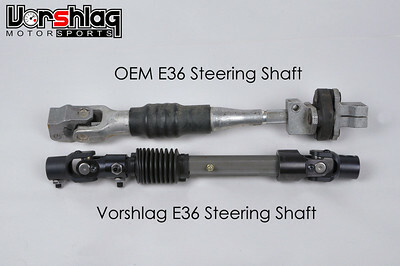 STEERING SHAFT IS THE SAME FOR RHD AND LHD E36! 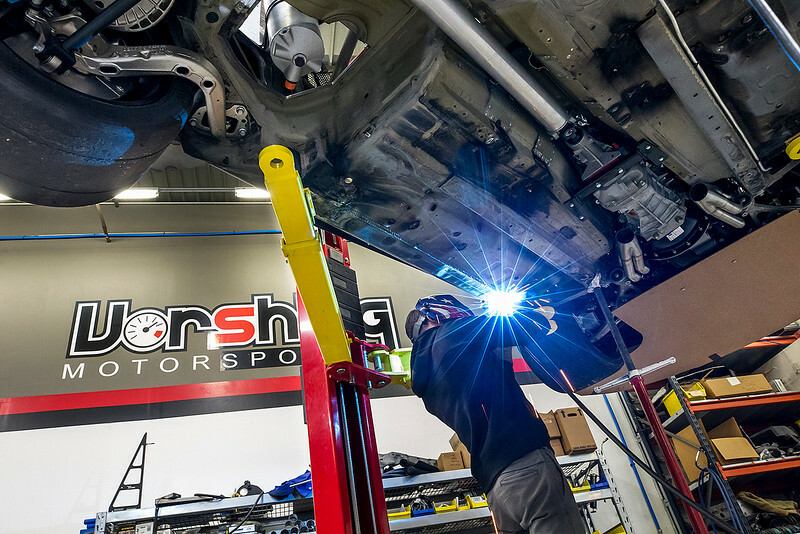 We weren't sure ANY of the traditional LHD parts we had developed over the last 12 years would fit the RHD chassis. The first part to test fit was our E36 Competition collapsible steering shaft. 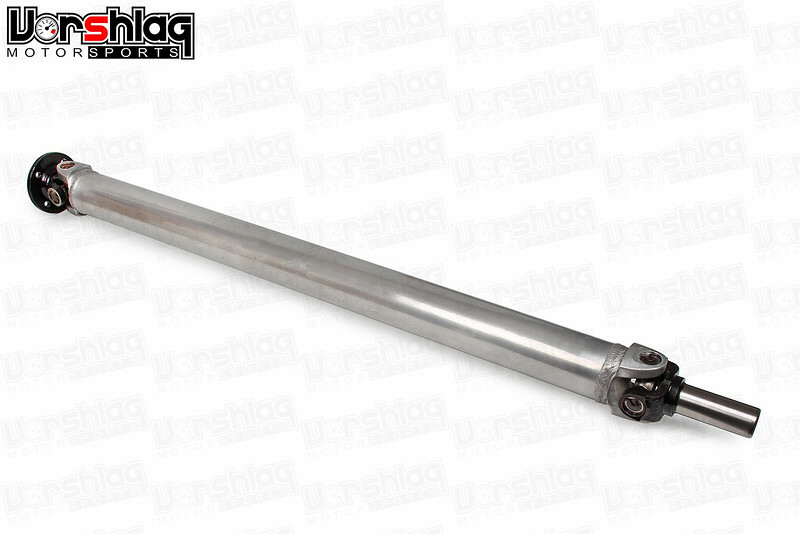 The BMW steering shaft is big and clunky, with a nasty rag joint at one end. 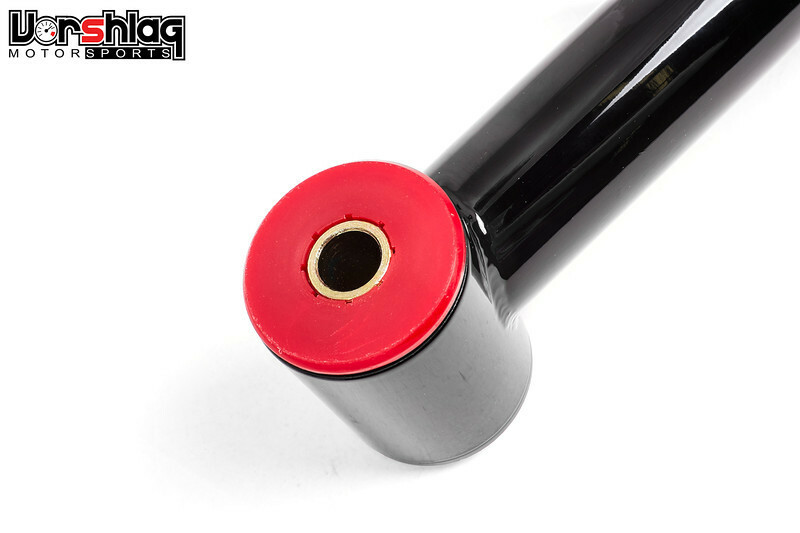 The packaging of the OEM shaft inside the engine bay makes it tough to wrap a V8 exhaust header through this area, so to gain room (and remove a sloppy rag joint) we created this 2-piece steering shaft a decade ago. Since then we have sold many hundreds of these shafts to LS swappers and other BMW racers. 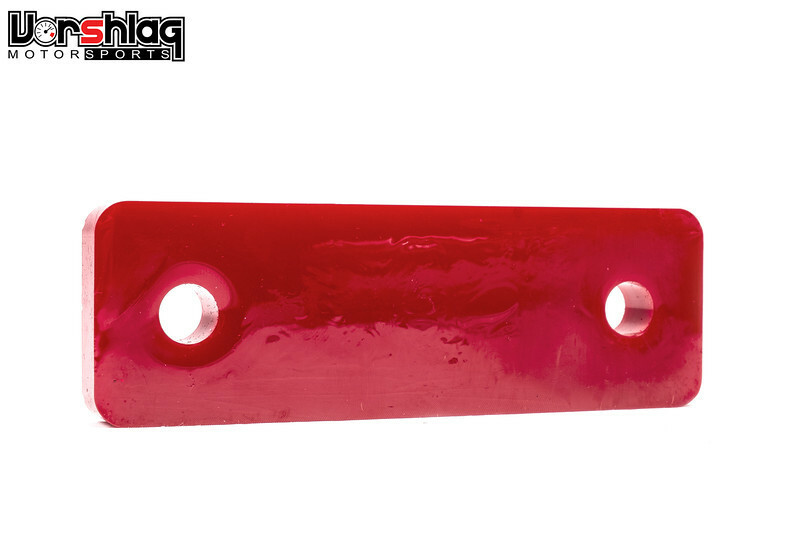 The length of our competition unit is the same as the OEM shaft, but our's is adjustable within the collapsible portion. We've since created this style shaft for E30, Z3, E46 and other BMW chassis using our unique BMW splined U-joint. I was fairly confident that A) we would need the room this shaft provides and B) that our existing E36 steering shaft would work on the RHD cars (we had sold many to Aussies over the years). Sure enough: it was needed and it works. 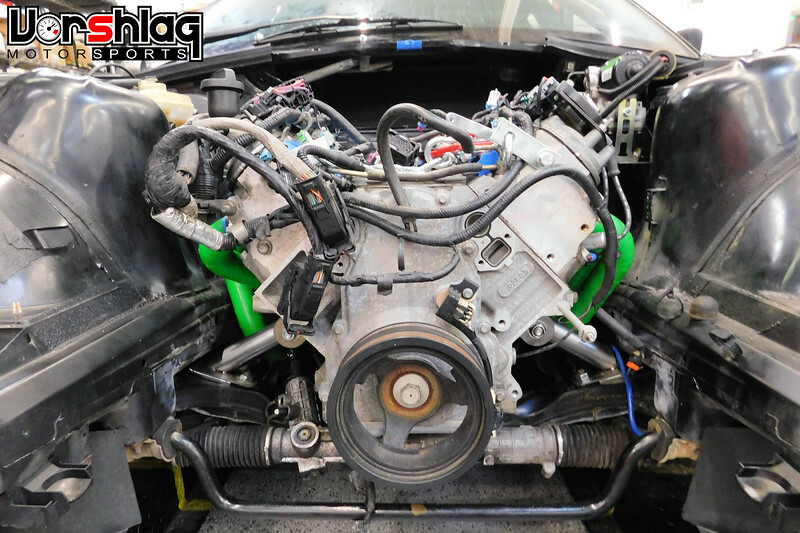 With the drivetrain updated with the proper fitting oil pan, bellhousing, starter, hydraulic TOB and the right steering shaft in the car we were ready to put the 5th gen Camaro LS3 engine and 1998-02 Camaro 6-speed trans into the RHD car for final drivetrain placement measurements. 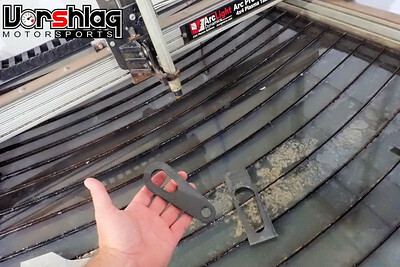 This may seem like a trivial step but its not only tricky, it can make or break a swap. After having done a lot of these over the last 15 years I've come to know where to look for tight spots, key associations for parts and the car that cannot be moved, and even ways to improve this swap for the RHD version. One of the first things to mark on any E36 or E46 LS swap using the T56 or T56 Magnum transmissions is the reverse lockout solenoid. The drivetrain was roughly positioned in the car and this interference point marked. Then the drivetrain came out and this sheet metal was "massaged" at the OEM trans tunnel. This bump was perhaps bit over-done on this Alpha car, but it gave us some leeway on drivetrain placement. We still needed to clear a few other new things. 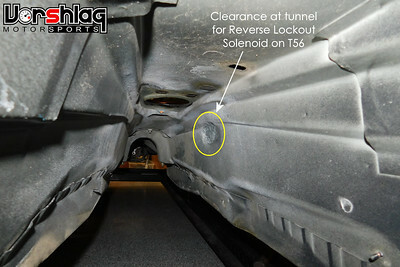 Next up were some unused flanges / protrusions on this T56 that were in the way of the firewall. I wanted to shift the engine back a bit more than our LHD model, to make up for the differences in length of the T56 vs T56 Magnum (these transmissions have very little in common, and the Magnum is about 1.5" shorter at the shifter location). 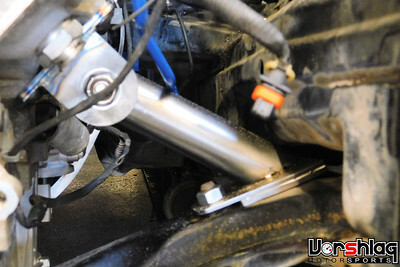 Next up the shifter bushing mounted to the underside of the tunnel needs to be removed. 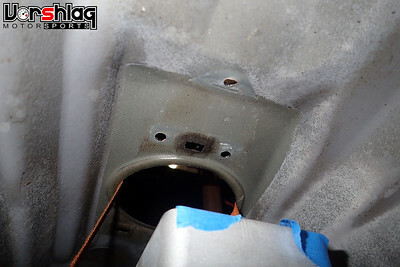 A couple of spot welds are drilled out and this spot welded bracket can go away for good - gaining valuable room at the back of the 6 speed transmission. Last edited by mylesloan; 08-30-2018 at 02:52 PM. Moving up front we had the 98-02 Camaro LS1 oil pan on the LS3 engine (with the associated oil pick-up tube/windage/baffle kit). At the point above we were still adjusting with fore-aft placement as well as lateral offset to best fit all of the variables of this swap. 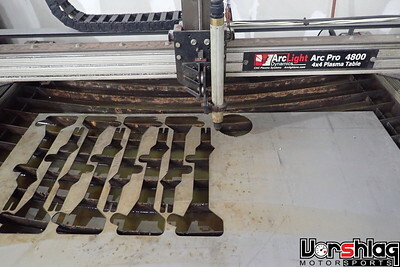 Our fabricator Aaron had marked the centerline of the car at the bottom of the crossmember, as shown. 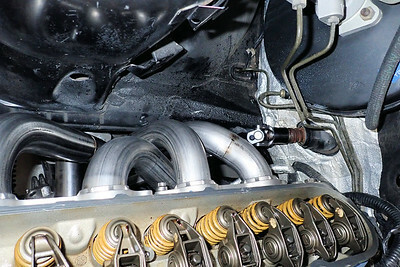 NONE of the other OEM oil pans fit this E36 crossmember this well - this is a MUST DO upgrade. We locked in the drivetrain placement in the next step. So with the clearance to the tailhousing of the T56/T56 Magnum laid out, and the firewall tweaked so we could shift the motor back further than the LHD swap, we could lock down the drivetrain location and start making some mounts. 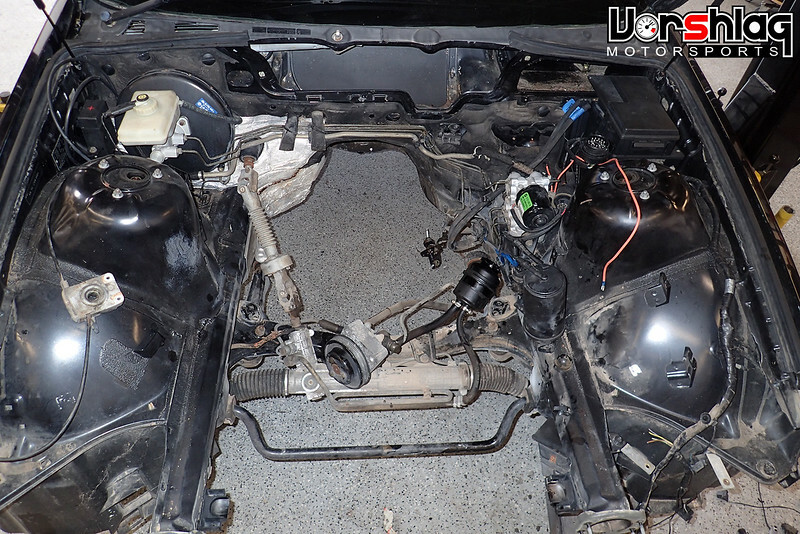 Its no secret that our LHD E36 swap has some drivetrain offset towards the passenger side - to get the most room away from the steering shaft. 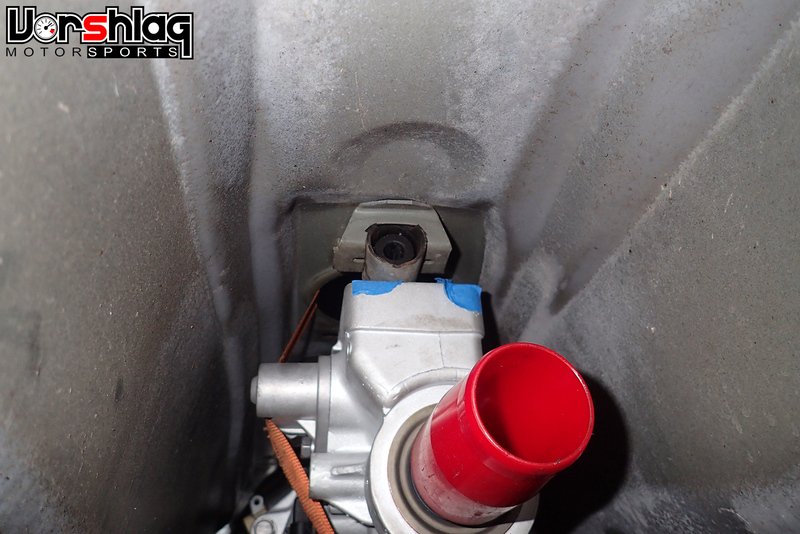 There is also clearance issues to the brake booster. 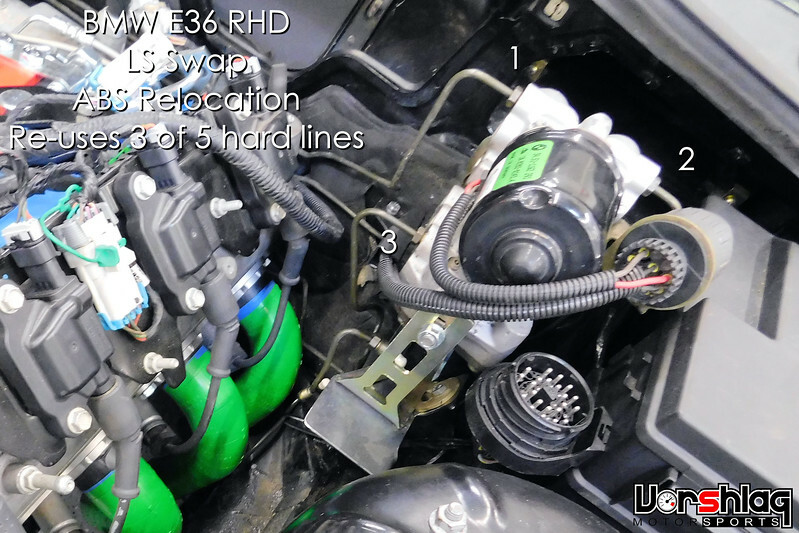 But on the RHD chassis the booster is further away from the centerline of the car, so the drivetrain offset is less - but still off center, and away from the steering shaft. 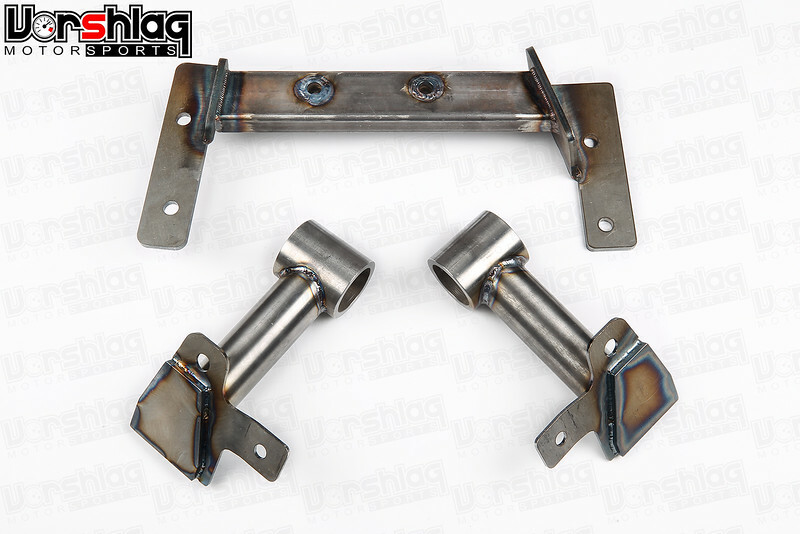 Using similar construction and bushing methods as our other LS swap kits - but with unique to RHD lengths - the motor mount assemblies were built. 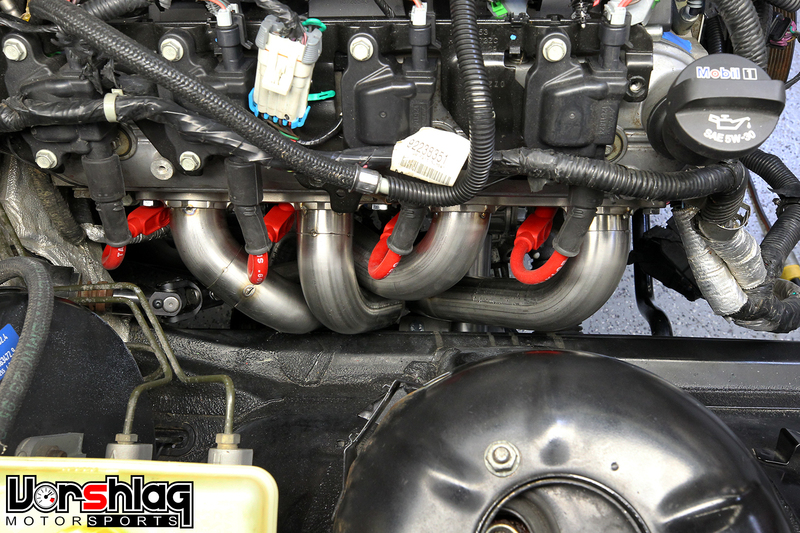 The engine height and driveline down angle were also set. With the height and offset of the drivetrain set the transmission crossmember could also be fabricated, tack welded, checked, locked in, and welded. The motor mounts are still tack welded (with a shim under the oil pan to take the load for now) in case we need to make a small tweak before the headers are complete. Another aspect of the RHD cars that was seemingly a little easier was the ABS relocation. This is always in the way of proper headers but we ALWAYS want to keep ABS functional on these cars. Look at what it takes to relocate on the LHD chassis (shown below). 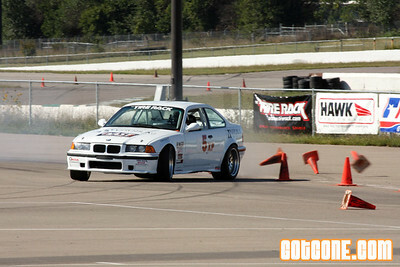 We lost the 3-channel ABS computer on our E36 LS1 car at the Solo Nationals in 2008 (water got inside the ABS computer) and the brakes immediately locked up at the slightest amount of pressure. We tried all sorts of tricks but it would NOT stop for crap w/o the ABS. That stupid $99 problem (that's what I paid for a replacement/used ABS computer 2 weeks later) ruined my whole autocross year. The braking went from a data logged 1.1g with M3 brakes and a functional ABS to less than a 1/3rd of that before lockup occurred w/o the ABS. It was a nightmare to drive like this, and I lost seconds per lap. Still makes me sick to think of it, nearly a decade later. There's no need to delete the ABS on an E36 - you'd have to have a pretty damned compelling reason to remove it from my race cars. If you are reading this you can no longer claim just "ignorance". 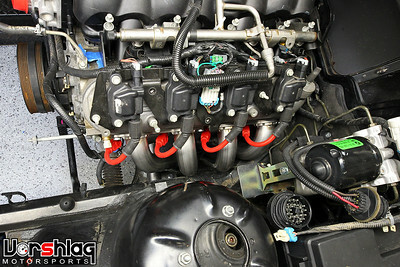 The entire ABS system on an E36 is independent of the engine computer (DME), as it is run by its own ABS computer. 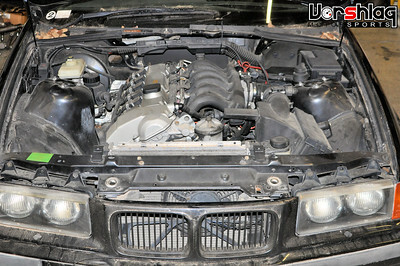 We've transplanted E36 ABS onto other cars, because its self contained. On some Z3s and the E46-up cars, its all tied into the DME and becomes a real mofo to keep if you do change to a different engine management computer (LS1 swaps). The factory E36 stuff is pretty darned forgiving, and we've used M3 and non-M brake masters with M3 and non-M ABS solenoids and various E36 ABS computers, and damned if they still don't work like a charm. You have to make sure you use a 3 or 4-channel computer with a matching 3 or 4-channel ABS solenoid and lines, of course. 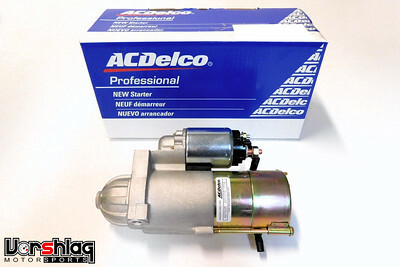 We've had the best luck using the 95 M3 3-channel ABS computer on 3-channel cars with the 95 M3 Master cylinder, but the ABS solenoid unit doesn't seem to matter (m3 vs 318 or whatever 3-channel unit). DON'T REMOVE THE ABS unless your class rules insist that it must be gone. Otherwise you're going to spend a good amount of testing time trying new master cylinders/balance bar settings/brake pad compounds/hydraulic changes to get the balance back. It might never brake as well, and without ABS will never be as idiot-proofed as it would be with it still functional. 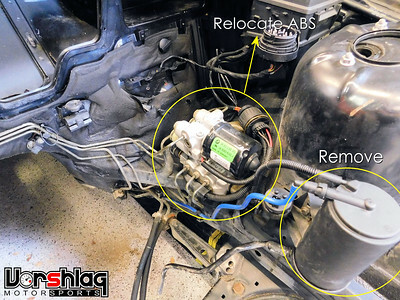 Again, the ABS swap is easier on the RHD cars because the brake booster isn't right in the way. We simply move it up vertically, as shown above. Now we only have the 3-channel kit in prototype form now, but we will test with a 4-channel also. We have taken our existing ABS bracket, built a bracket that bolts to known locations on this RHD chassis, and moved the pump upwards. 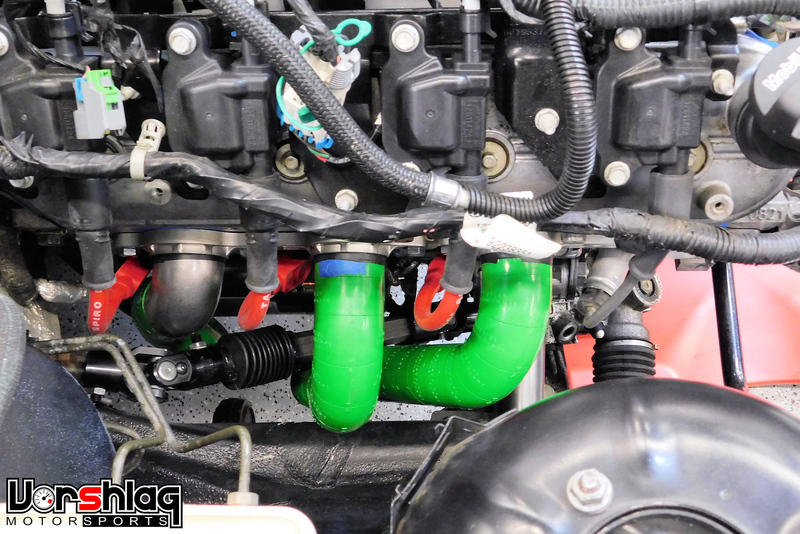 As you can see above, 3 of the 5 OEM brake hard lines were long enough that they could be bent to fit the raised location, and we will make two short braided flex line jumpers for the other two. I will show more of this towards the end of the R&D project. BONUS: No wiring re-work needed! 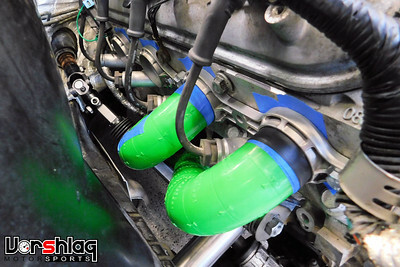 Sure wish it was this easy on the LHD E36 Swap! 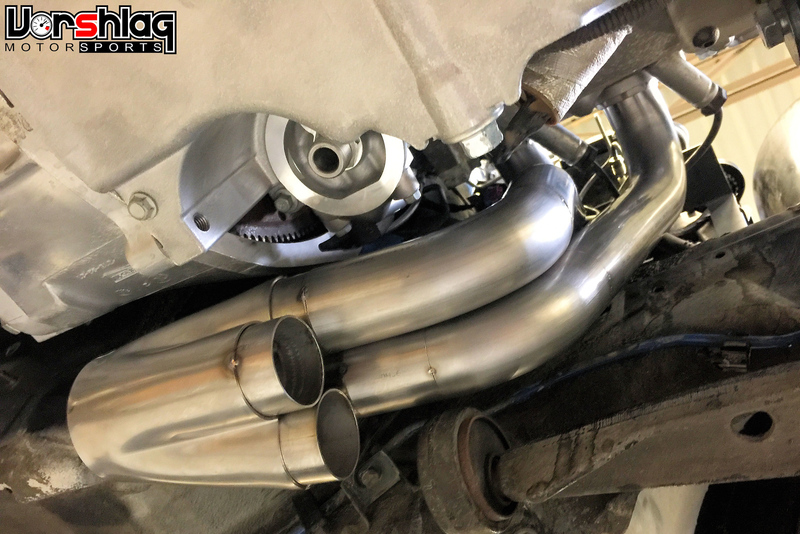 This was a long time coming - all of the work above needed to be completed before we could work on the last "hard part" of this swap - the stainless steel, full length exhaust headers. 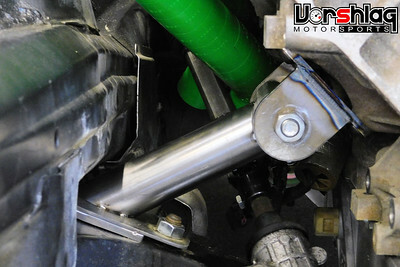 The driveshaft will be ordered soon, and its relatively easy once we have the drivetrain in place. 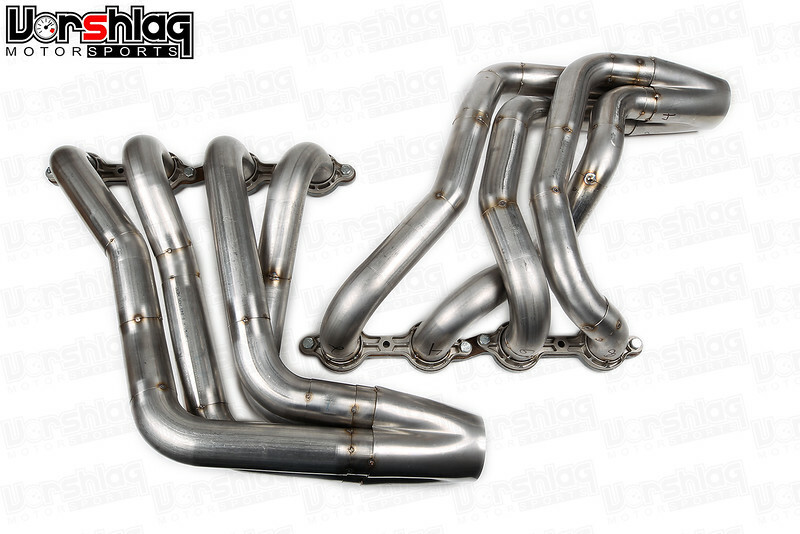 We also had a rather enormous delay on getting header fabrication parts. Most of this was ordered in May 2017, arrived in late Nov 2017... Long story. "Stuff happens." 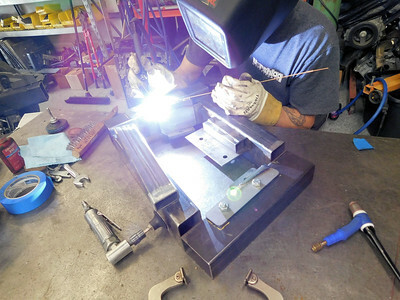 Aaron is making his first prototype/production header for a V8 swap, so I'm working with him throughout the build, as is our other fabricator Ryan. This was kicked off this week but we will update the thread here with more progress on this TIME consuming step shortly. As with most of my build threads I like to talk about what comes next. In this case about a week of prototype header fabrication, interspersed with other customer projects. We have to hurry here because another production V8 swap header job is right behind this one. At least now we have the ICE modeling kit, which should speed up iterations of tube layouts. I hope like Hell to be at the point above on this project very soon - ready for final welding. Then the headers can be sent off, 3D modeled, and replicated with a CNC bender for a pre-production test fit. While that is happening the driveshaft can be built, we can final weld the motor mounts, and get all of the mounts powder coated and pretty. Last edited by mylesloan; 08-31-2018 at 11:49 AM. Project Update for January 25th, 2018: I am a little late in updating this but the prototype headers are built and shipped off for modeling and CNC bent, pre-production manufacturing. These were actually finished last week and have already been sent. Once we get these back and verify the fit with the current mounts and bits we can start turning these prototype pieces into fixtures and make production runs of these parts. This was a lot of work and was worked on over 3 different periods. Since we are eating the development work for this RHD E36 kit (like we always do) we have to space this out between paying jobs. 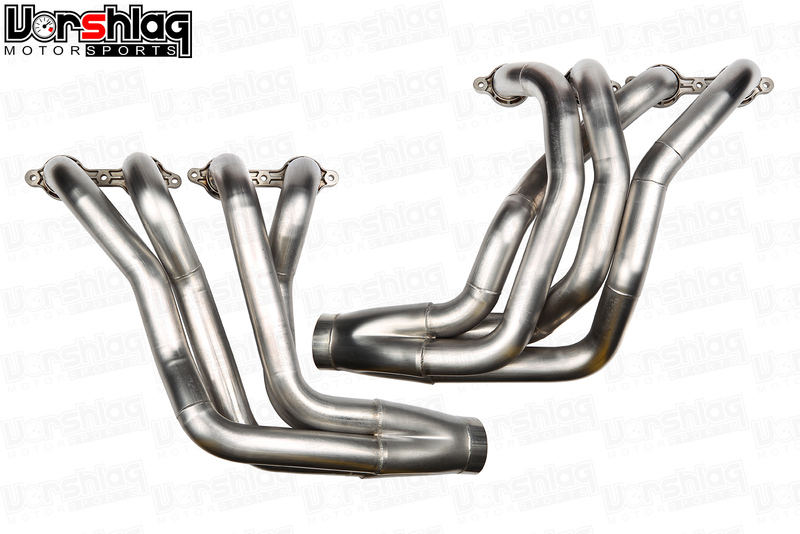 Aaron spent 53 hours making these headers - which is pretty normal. Underneath we have to place the collector in the right spot - and aim for this from above. 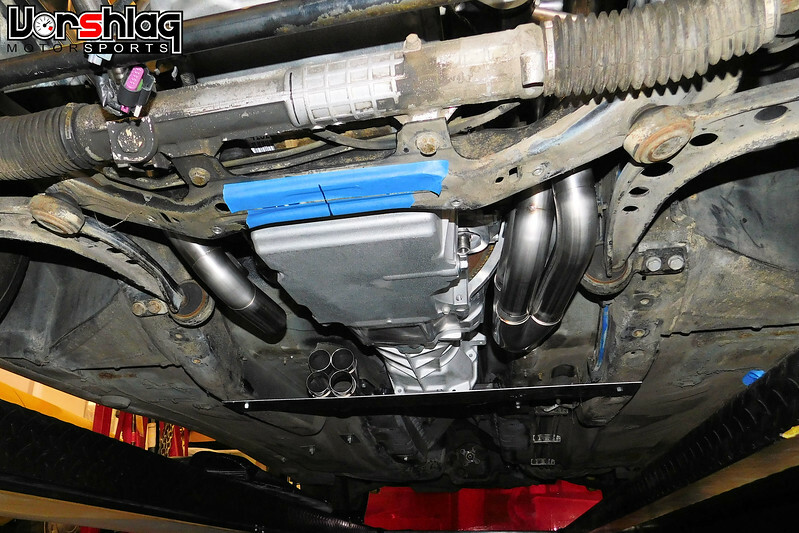 We go to great lengths to keep the collectors tucked up above the bottom of the car - unlike many production headers you can buy, that hang too low and get smashed up in street driving. The right side header (above) was super tricky to package. 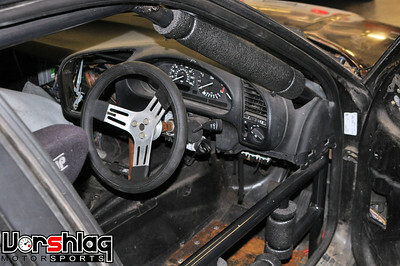 Not only did it have to wrap around the steering shaft on this RHD car, the LS starter was on that side and in the way. Super tight confines made for a few failed starts on the design... tubes had to be scrapped when one finally fitment issue popped up. The left side header (above) was actually super easy - there was no brake booster in the way, the ABS was able to simply be raised up on a new bracket, and there was no starter or steering shaft in the way. From above the headers look pretty compact and close to the engine - because they are. This is a lot easier engine bay to work on than with the BMW engine. 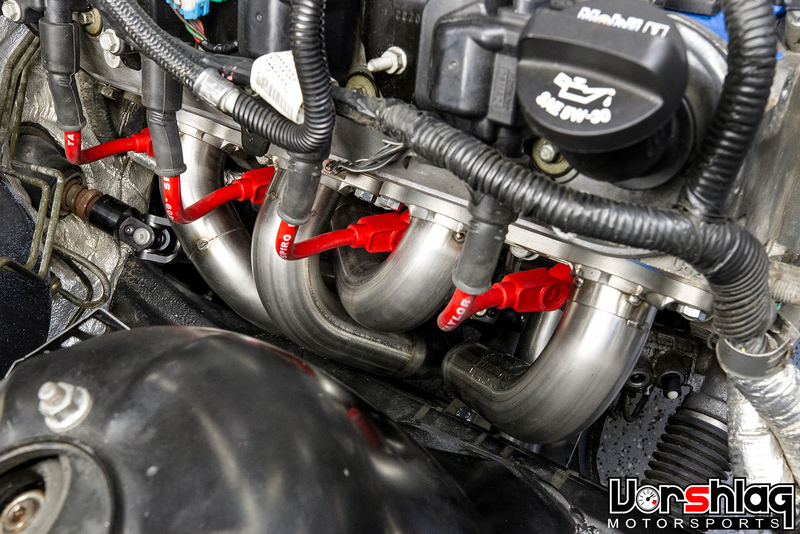 From below you can see the primary tubes and collectors tuck nicely between the V8 engine and the lower control arms. 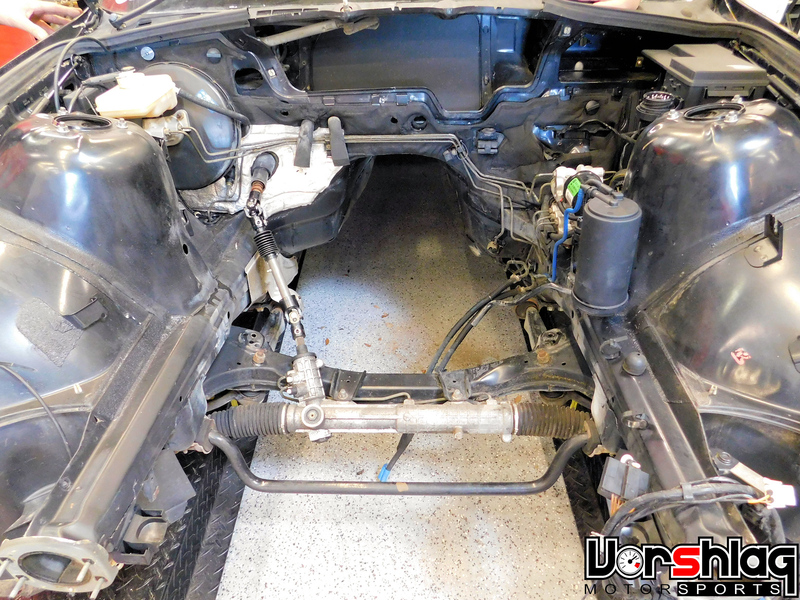 They route into two cavities in the floorpan. 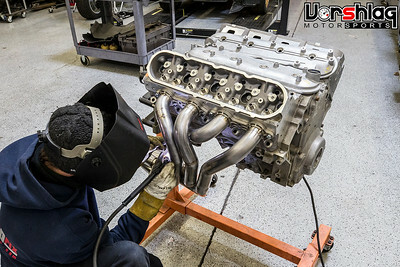 At this point we were looking nearly complete and the headers came off the engine and out of the car for some final welding. 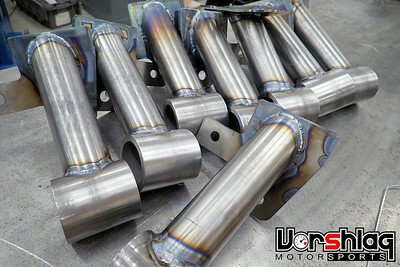 With the headers bolted to an LS engine, Aaron added some TIG weld tacks to the various tube sections. 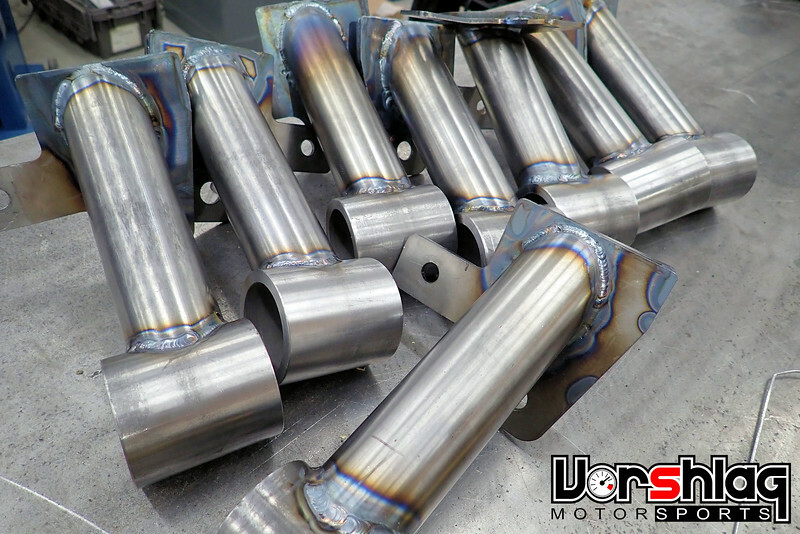 Normally we would back purge each tube and final weld them but for this set we are trusting the production manufacturer to not mess these up and shipped them off just tacked. 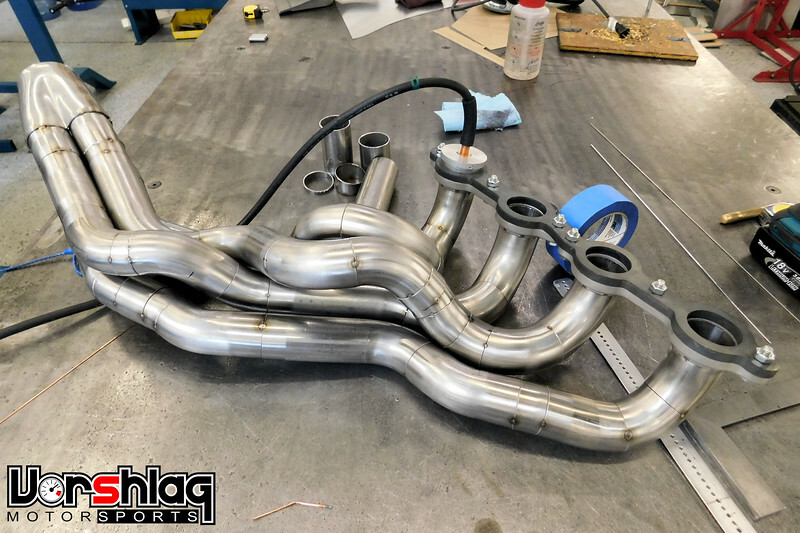 We will final weld them when they return and this set will go on our tester Jack's RHD E36, after we test fit the first production units. 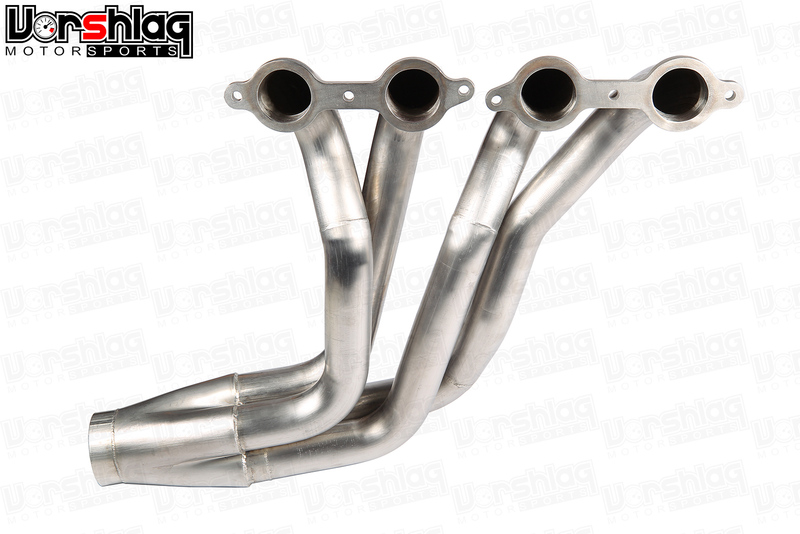 While we wait for the first production header set to arrive we will order the driveshaft (an aluminum 3" diameter unit like the one in the E46 M3 below), then build the brake lines that were too short to bend to the ABS systems' new location. That will wrap up the "Stage 0" development for this customer and we can then add these RHD parts to our catalog. Last edited by Fair! ; 01-25-2018 at 04:37 PM. Is it available to buy the kit yet? Project Update for October 12th, 2018: Today is the day we begin selling production Stage 0 kit for the RHD E36 chassis. Yes, its ready to buy now, and completed kits will ship within 2 weeks! 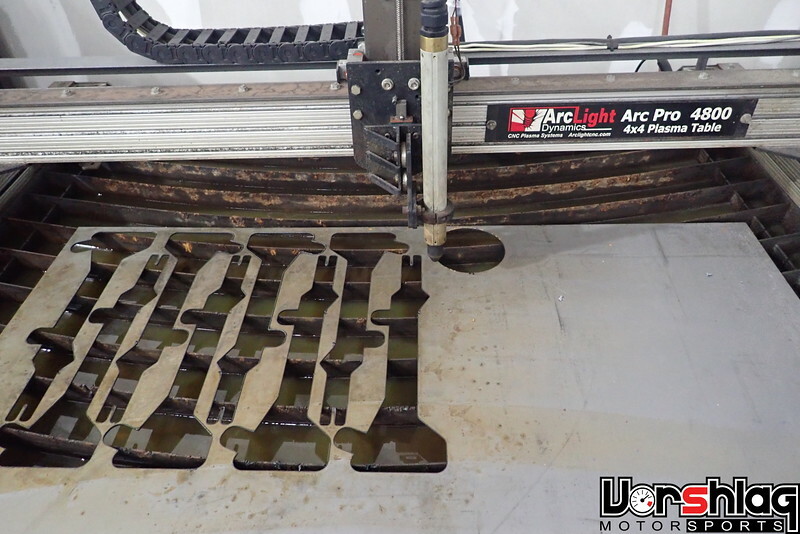 Our newly added CNC plasma cutter is being used every week to make production quality, precision cut steel parts used in many of our fabricated production parts - like these new LS swap kits. 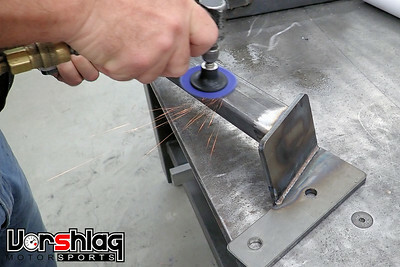 This week we finished up a batch of the RHD motor mounts and transmission crossmembers. Those are heading to the powder coater tomorrow! 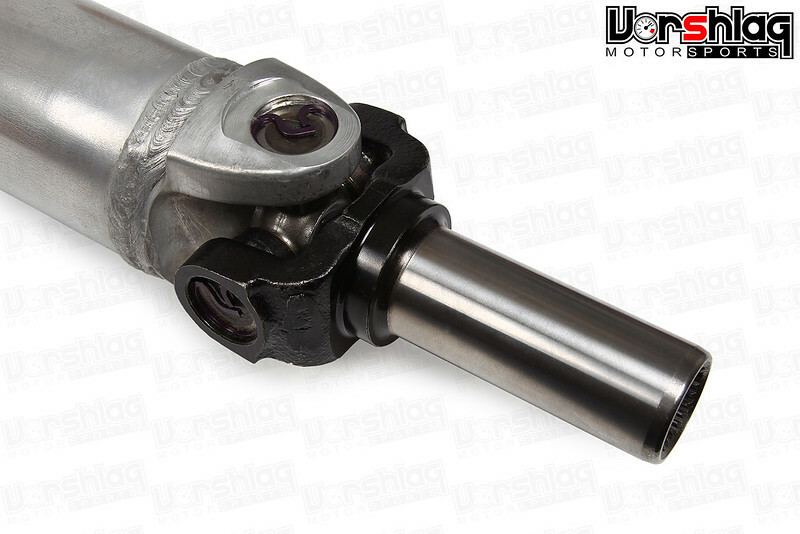 The clearances are tight around the starter, steering shaft, frame rails, and even the mounts themselves. 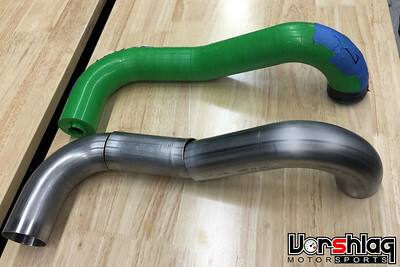 But the production versions are set, the tolerances are tight, and they are ready to ship. 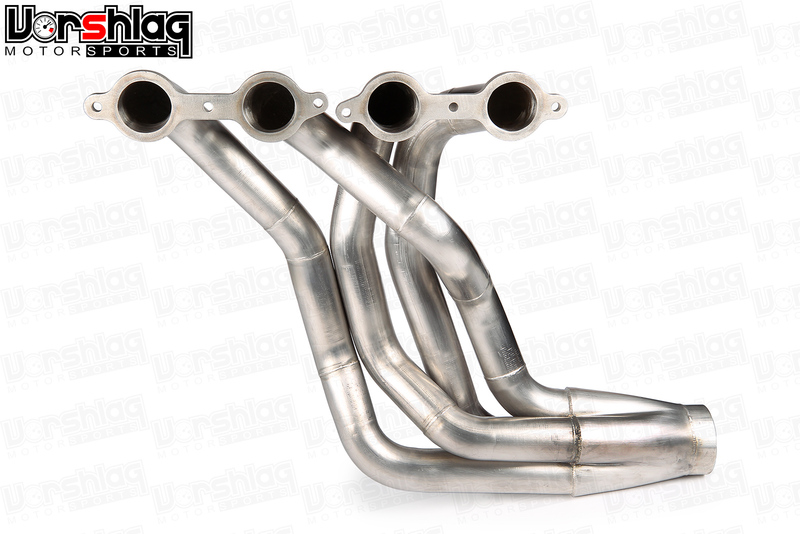 The stainless long tubes look good and have bigger primaries (1-7/8") than even our LHD swap headers, with no price increase. There is no downside to the slightly larger larger primaries for anything from 4.8L to 7.0L factory LS engines, or even larger displacement aftermarket builds. These are made from 304 stainless steel, with intricately cast flanges, mandrel bends, and TIG welded junctions, in a raw stainless finish. 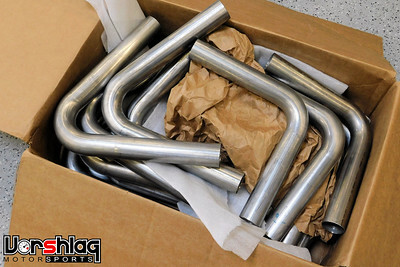 These pictures are from our first batch of PRODUCTION headers, and we have a decent amount in stock. 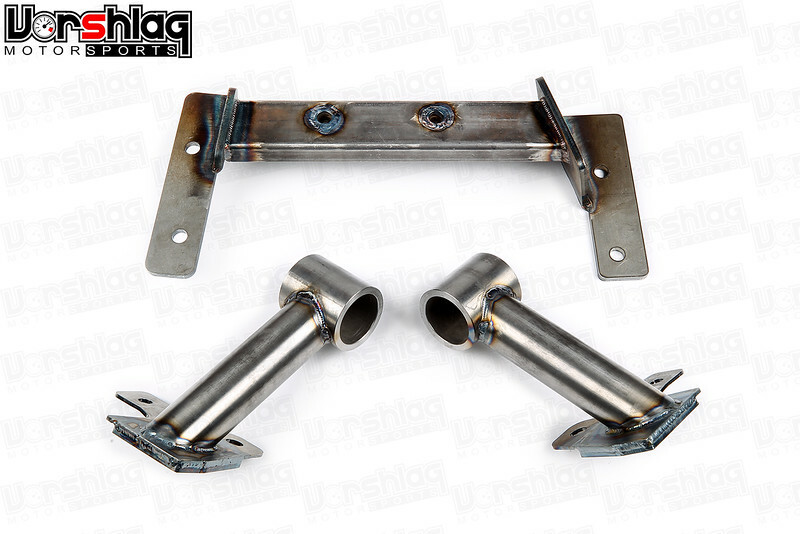 They will include a pair of stainless 3" V-band flanges and O2 bungs, which you will need to weld in place. The production RHD LS swap motor mounts and transmission crossmember are unique to the RHD car. To differentiate these RHD E36 mounts from the similar-but-different LHD mounts, these will be be finished in a different color than gloss black: metallic silver. I will post a follow up with production powder coated pics soon. Not shown in the raw steel RHD parts above are the polyurethane bushings. 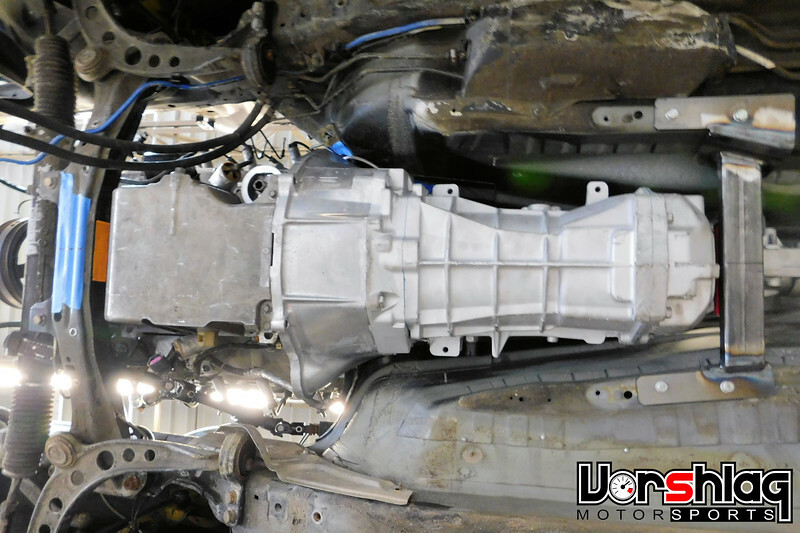 These will be installed into the motor mounts (above left) and on the transmission crossmember (above right) to minimize NVH, while still keeping the driveline from moving relative to the chassis. 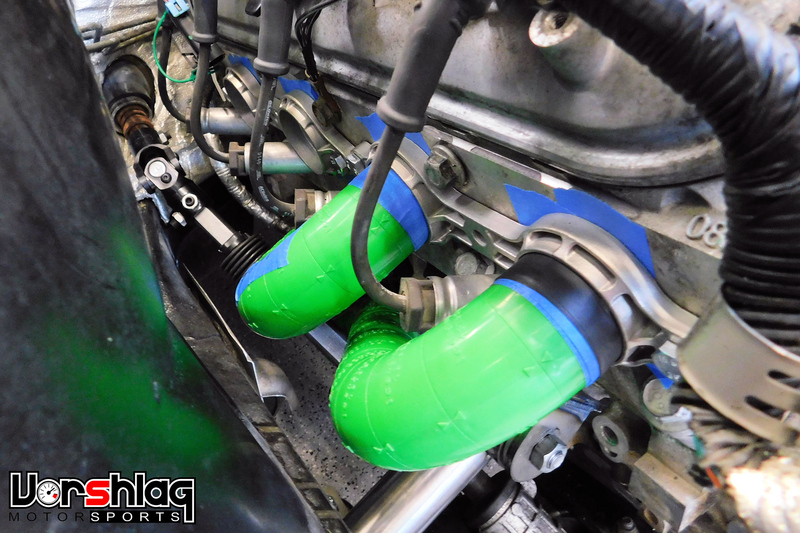 These work well on street car and race car builds alike. 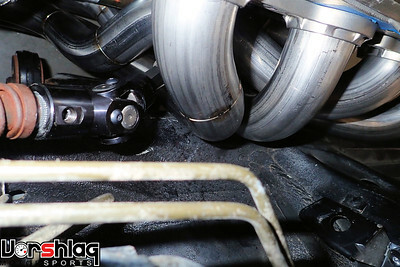 The driveshaft is unique length to this swap, due to a slightly more rear biased placement of the engine and transmission for the RHD car. 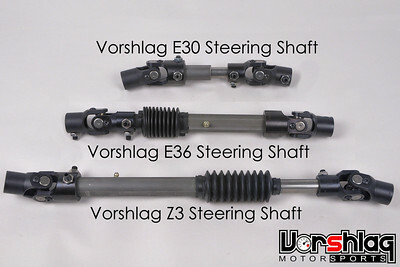 This is to clear some unique firewall items on the RHD variant of the E36, and it makes for a slightly shorter driveshaft. We offer the driveshaft in two versions: one for the 1998-2002 Camaro production LS1 T56 and another for the aftermarket T56 Magnum, which is a different length and output shaft spline. 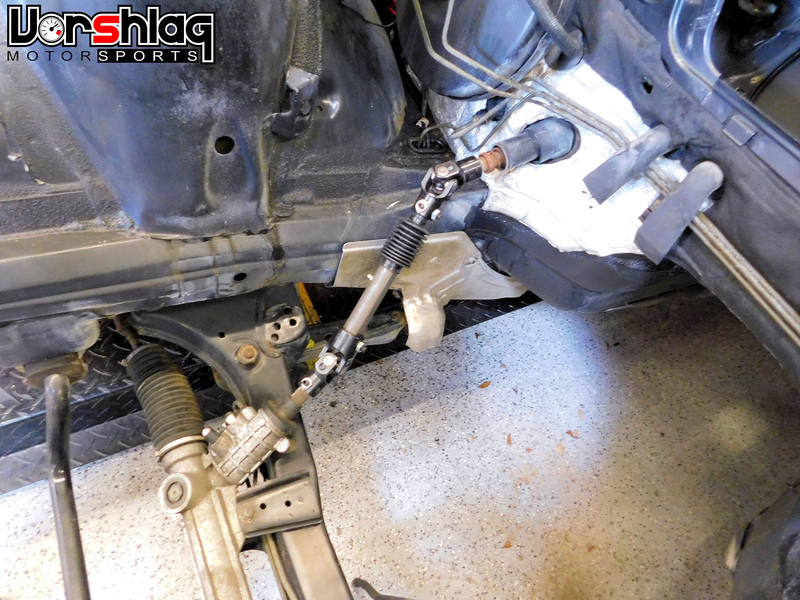 This is the driveshaft installed in our tester Jack's RHD E36, above. You can see the transmission crossmember in this pic, too. 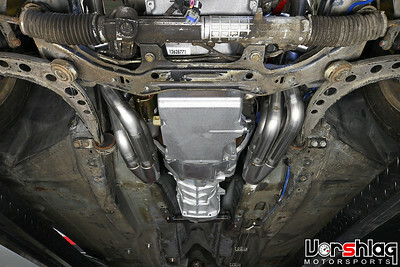 That is also unique to the RHD E36, due to the slightly different fore-aft placement of the drivetrain here. These are in production now and we will have the first batch to the powder coater next week. 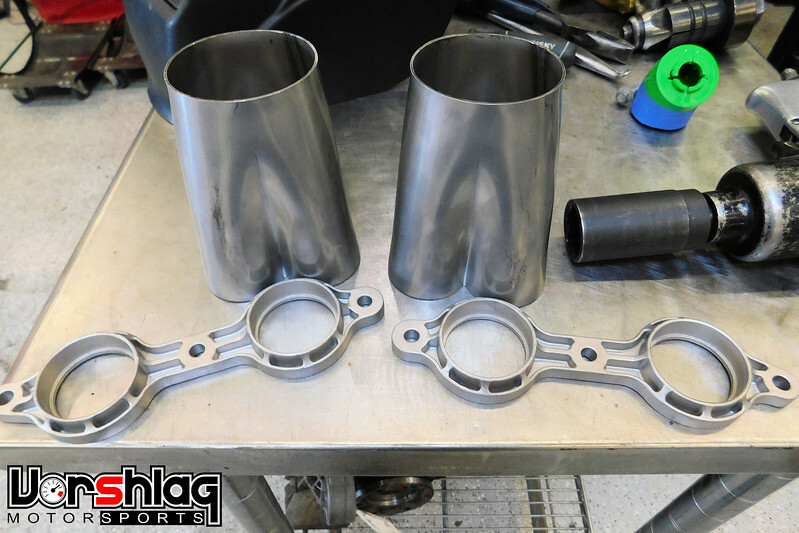 We are not selling these "Stage 0" items separately during the initial launch, but when this first batch of parts is gone we will make more parts and add individual items to the E36 RHD section. As always, we caution people from purchasing just mounts or just headers, as the headers/mounts/trans crossmember/driveshaft are all keyed off of each other, and likely won't work with other brands of parts. 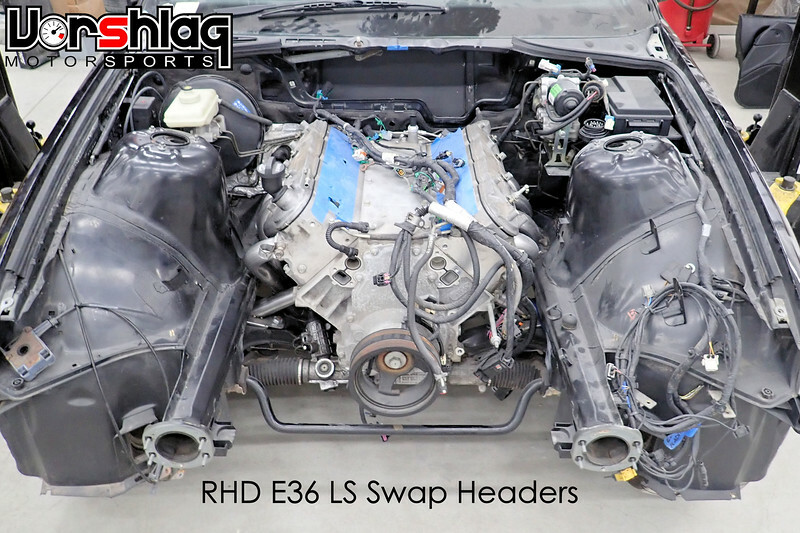 We have a few items in that RHD E36 LSX section outside of the Stage 0 parts that will help you get your swap on the road. We will add the ABS relocation kit and mounting bracket very soon there, too. Last edited by Fair! ; 10-13-2018 at 12:57 PM.